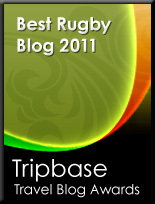 TOTAL FLANKER...a rugby blog: To Touch or not to Touch? Their enjoyment is spoilt by arguments over the rules, whether a touch was made etc etc. 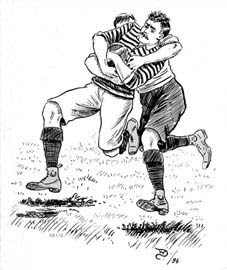 Certainly when playing informally this can be a problem – there will always be those in any sport or any walk of life who try to bend the rules and touch rugby is no different. The way to deal with this issue is to formalise it – turn the game into Touch with a capital “T”, agree a set of rules beforehand (better still, play to official Federation of International Touch (FIT) rules) and get someone to referee the game to those rules. Their enjoyment is spoilt by people who are over-vigorous when touching, or by the fact that they themselves are accused of being too aggressive when they touch. Again, being overly aggressive is outlawed under FIT rules, punishable by a penalty– put the decision in the hands of the ref and get on with it. There was even one bloke sent off in a match this summer for raising an elbow going into contact – perhaps a little draconian from the ref but, like 15s, you play to a set of laws and accept the ref’s decision. They are frustrated by the fact that they are neither quick enough nor skillful enough to get the most out of touch. This is a more difficult one – certainly not solvable by the appointment of a referee! I’d definitely say that playing Touch can improve skill levels and help develop handling and spatial awareness in attack, as well as communication and awareness in defence. The difference in some of our younger players towards the end of this summer’s Touch league was considerable. In the last couple of games the defensive communication and organisation in particular was streets ahead of where it had been for most of the competition and these guys really learnt something. As for pace, well if you haven’t got it, you haven’t got it. I should know. Once upon a time I was fairly quick and can still summon up a head of steam occasionally but, at 42, what I lack (and what our team lacked this summer) is real gas. I found on a number of occasions this summer that I had the ability to see a gap or even create the gap and sometimes even had the pace to go through the gap, but what I was missing what the acceleration to then run away from the opposition. The trick is to balance your team with a couple of flyers who can follow you through the gap and score the tries. We had a couple of such quickies last summer and it made a huge difference – it also enables those blessed with less pace to contribute to the team effort and get far more out of the experience. The discussion on Saturday’s a Rugby Day then moves onto a more general point about positional attributes, with the blog’s author, Blondie, advocating the case for the number on your back being irrelevant - that, outside of set pieces, all 15 players on the field should all be able to run the ball, pass the ball, kick the ball, tackle, catch a kick etc. Certainly that’s true at the top end of the game and this was always Clive Woodward’s mantra, famously once sending the London Irish team he was coaching out onto the pitch numbered 1 to 15 based on the alphabetical order of their surnames. Whilst it's obviously important that anyone with any ambition in the game has to master the basics, the danger of the "numbers on your back being irrelevant" approach is that forwards stop doing the things they are designed to do (hitting rucks and driving mauls) and spend an inordinate amount of time clogging up the backline, while backs end up embroiled too often at the breakdown and are out of position when possession is secured, a disease that has afflicted the England national team post RWC 2003 and from which they are only just beginning to recover. I would also refer the more casual player to my increasingly comprehensive library of Playing Guides to discover the skillsets and, more importantly, mindsets required to play certain positions on the field – where the number on the back of the shirt is also irrelevant but only because the shirt is so old it’s disintegrating and the number has been ripped off long ago.